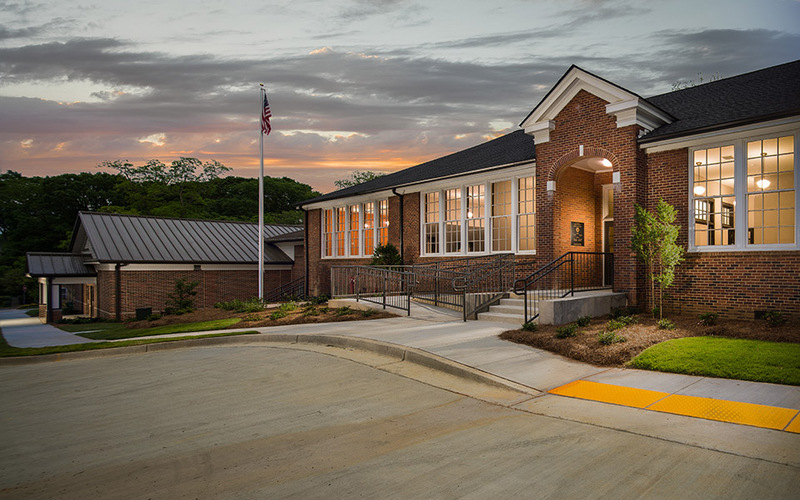 Garbutt Construction Company worked with Carter Watkins Associates Architects to fully renovate the Howard Warner Building which now serves the community as a Boys and Girls Club. Originally constructed in 1935, the Howard Warner Building was named after Professor Howard Wallace Warner who served as principal for over 30 years. Within Howard Warner, the original wood floors were beautifully refinished while all new plumbing, electrical, and HVAC systems were installed to meet today’s building standards. The original front windows were restored and the remaining windows were replaced, keeping the original design in mind. The bottom floor contains offices, a warming kitchen, and a multi-use space which can be rented out to community members. Some of the offices may be used as a business incubator. The upper floor is occupied by the local Boys and Girls Club and YMCA and is comprised of classrooms, art rooms, and a multi-use space. Structural reinforcements were completed to accommodate the reconfiguration of interior walls to make large game rooms and event spaces possible. In addition to the renovation, Garbutt Construction removed a building that stood adjacent to Howard Warner since 1956 and replaced it with a new, 9,109 square feet gymnasium. The gymnasium is a pre-engineered metal building with sports flooring. A panther, the original Howard Warner school mascot, is featured on the floor at center court. The gymnasium also serves the YMCA and Boy and Girls Club and can be rented for events.